A motor grader, sometimes referred to as a “road grader” or simply, “grader,” is a heavy equipment vehicle whose primary purpose is to finish grade, as opposed to rough grading done by scrapers and bulldozers. It is commonly used for Construction, Road Paving, Soil Foundation, Drainage Ditches, Bank Sloping, Soil Foundation, and Civil Engineering. 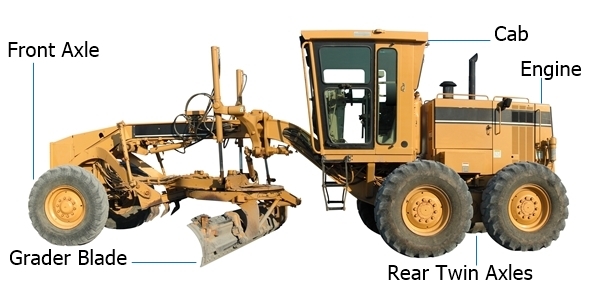 Motor graders are equipped with three axles, two in the back that carry the cab and engine, and one in the front that sometimes has a second grader blade. The primary grader blade is located between the front axle and rear axles. According to Forester Media, the “blade is attached to a circle that is mounted on a rigid, long-wheelbase frame. The frame, in turn, features an oscillating front axle and pivoting rear tandem axles.” Depending on the type of motor grader, it may have options for additional attachments, and may be able to operate multiple attachments at once. Steering wheels are typically standard in the cab and the attachments and blades are operated with either a joystick or fingertip-actuated controls. Motor grade operators must be skilled with precision operation, and new styles of graders have excavator-like hydraulics that allow for better maneuvering. The hydraulics allow for sloping, straight-line, and other grade options. As with any equipment purchase, the size of the project decides the size of the machine. Motor graders come in a variety of size options for many different projects such as freeway building, grading city alleys, and forging new residential roadways. Graders range in weight from about 10,000-137,000 lbs. Precision grading requires hydraulics that perform effortlessly and according to the control buttons or joystick. The hydraulic valve and its link between the controls affect the reaction of the blade. Because most motor graders use variable-displacement hydraulic pump systems, the functions don’t draw power from the engine until activated. For the smoothest operation, look for motor graders with this functionality. Blades come in different sizes and have different swing and tilt options. Most blades can rotate 360°, swing up to 90°, and tilt 20° or more. The curvature of the blade also matters and depends on what you want to do with your machine. Deeper curved blades are good for rolling material to the sides while flatter blades are good for carrying material. Motor graders must balance horsepower, speed, and traction for maximum efficiency. At low speeds, they are limited in their traction, but at high speeds, the horsepower is limited. There are several options available to deal with this issue, including direct-drive power-shift transmissions with inching capability, Dual drive modes: conventional clutch system and torque converter, variable horsepower engines that automatically power up at high speed. There are several popular manufacturers in the backhoe market including Caterpillar, John Deere, Komatsu, and Volvo. Looking to compare motor grader models side-by-side, from either the same manufacturer or competing manufacturers? RitchieSpecs allows you to compare the dimensions, specifications, and operational aspects of over 200 motor grader models. Once you’ve found the motor grader model that fits your needs, browse motor graders for sale on IronPlanet and Ritchie Bros Auctioneers.